"Twelve Tomorrows is published by Technology Review, Inc. ... (c) 2014" on copyright page. Publication date from Amazon.com. "Limited Edition" and "Display Until 8/31/2015" on front cover. 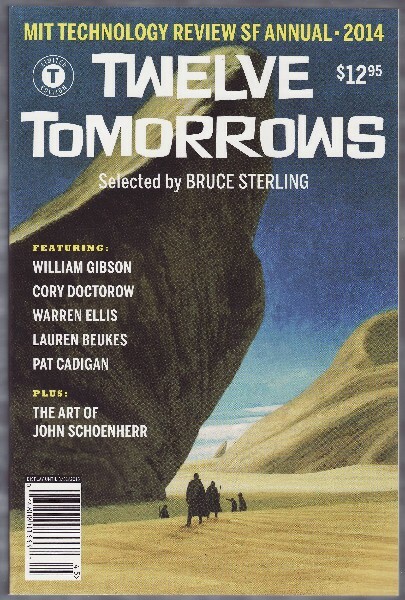 "Twelve Tomorrows editor: Bruce Sterling" on copyright page. "Selected by Bruce Sterling" on front cover. "$12.95" price on cover, and $12.95 price for this "limited edition print volume" per publisher's web site http://www.technologyreview.com/twelvetomorrows/14/. Starting with the "Contents" page, there are 8 un-numbered pages preceding page number 1.